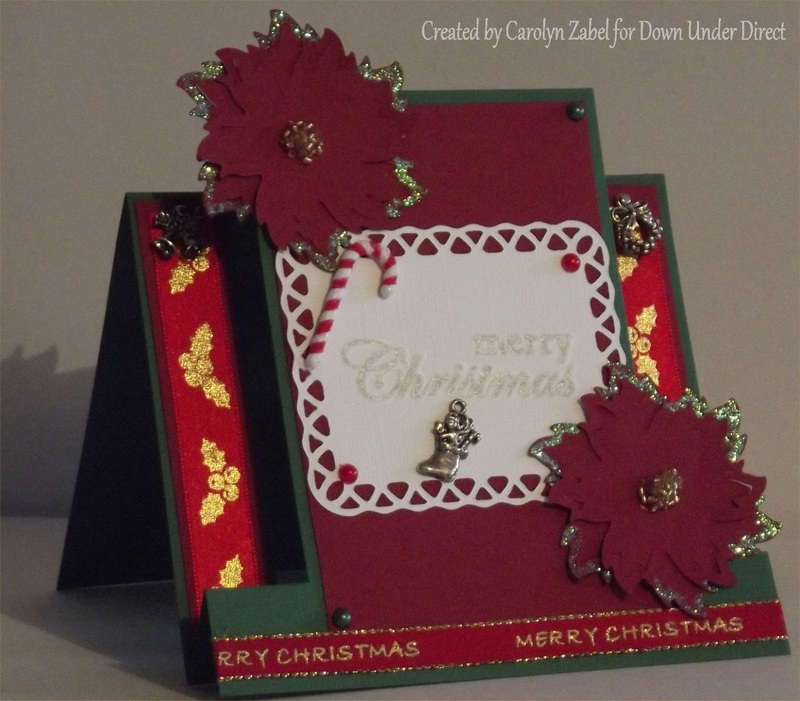 The pre scored step cards are great for a special Christmas card. Teresa Collins At home paper. 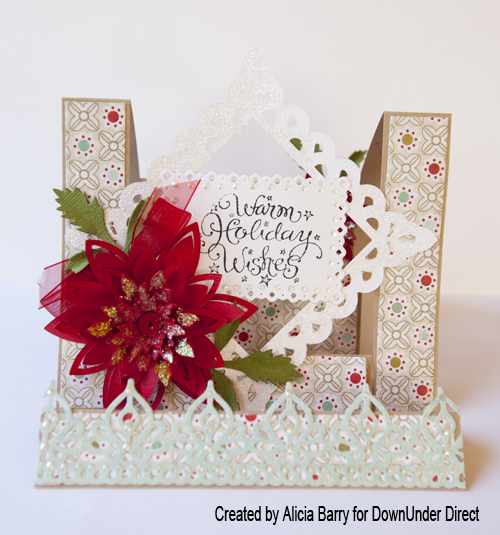 The expandable Lattice die makes a wonderful back ground for any Christmas card. 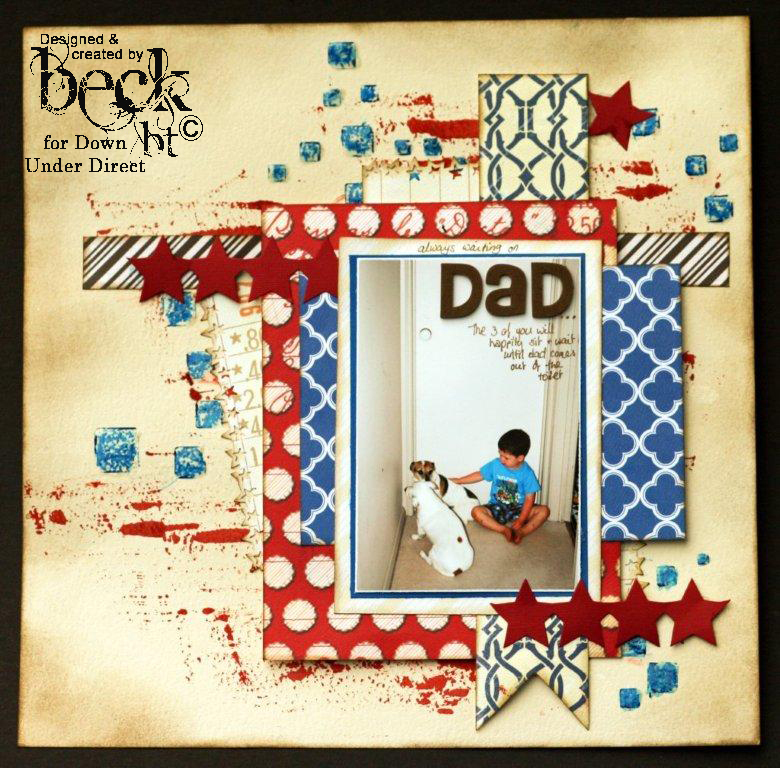 Today's project is a layout from Beck. 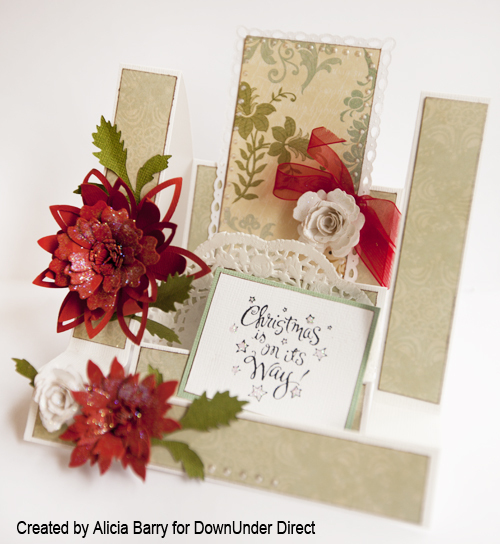 Bazill Cardstock has so many great Christmas Colours that you won't have a problem matching to any photo. 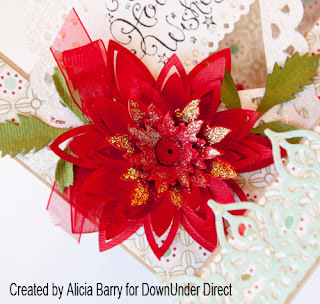 Here is a cute idea for a gift card holder. 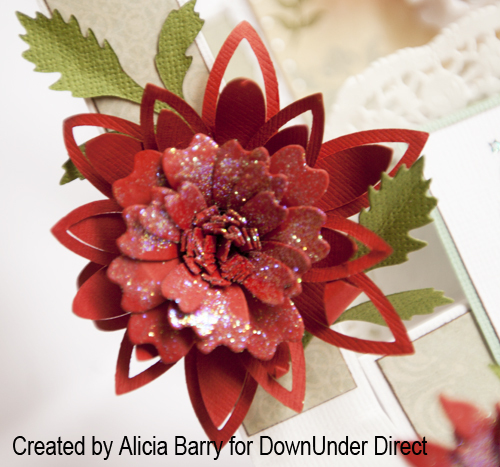 Christmas is only a month away so to inspire your Christmas crafting we have a couple more Christmas projects to share. "The new pre-cut step cards make your Christmas card list so much easier to complete and with stunning results." The Aster flower topper looks very much like a poinsettia and is the star of the show on this page. 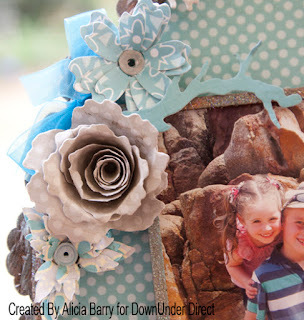 "Oh these new step cards cut and made by down under direct are the best things ever…. 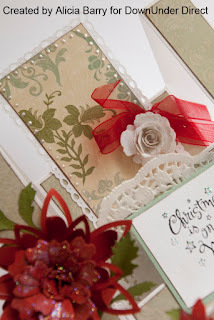 So easy to now create a beautiful styled different type of card…." 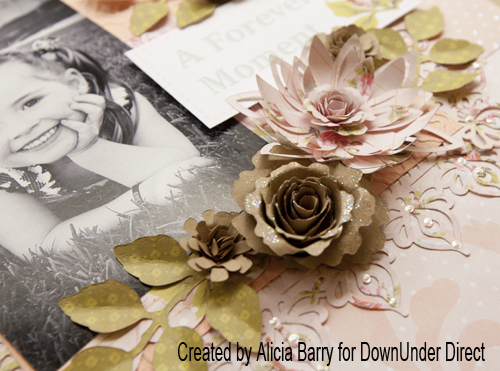 Here we have another lovely layout from Alicia. "I'm loving the tag making fad lately. 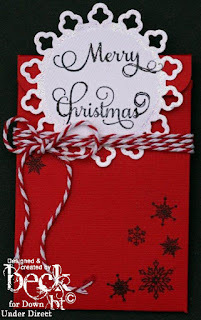 Once completed, the tag can be used as part of a gift in place of a card, or even adhered to the front of a card as an embellishment." "I'm going to show you how to create a metal cover for a notepad. It's not really metal though - it's an effect achieved with paint and ink." Take a piece of thin chipboard and emboss it using the Spellbinders Industrial embossing folder. Trim it down to the required size. Using cheap silver acrylic paint (the cheaper the better for this - the better quality paints will leave too much of a sheen) paint the covers and allow to dry completely. 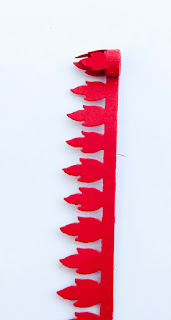 I prefer to apply the paint with a sponge as it leaves a thin coat of paint that dries quickly. Once the covers are dry, make some scratches in the surface with coarse sandpaper, paying particular attention to the edges of the covers. Apply some brown ink to the covers. This will highlight the scratches and give the silver paint a slightly rusted look. I found a piece of text from an old book that is an apt title for this notepad that will be my daily 'to do' list notepad. 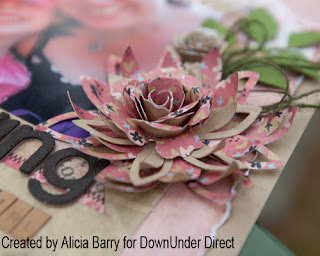 I adhered this torn piece to a scrap of Kraft cardstock, and then die cut the title with one of the Resplendent Rectangle dies. This was then adhered in place to the front cover. 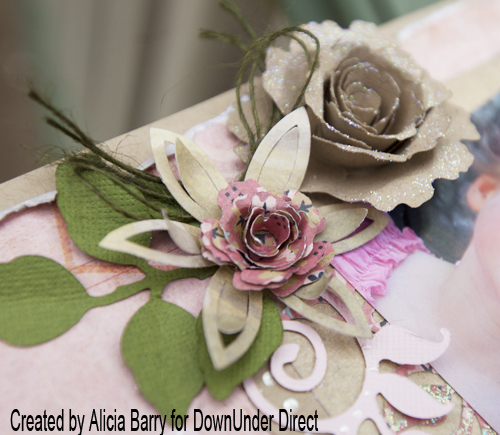 The covers are now ready to be made into a book using your preferred binding system. Today's project is a super cute layout from Sheree. 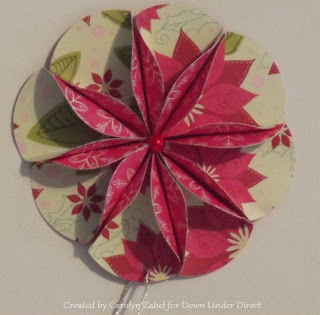 This little Christmas ornament would be perfect to make with children. It can be made quickly and all you need is the circle die and some paper. 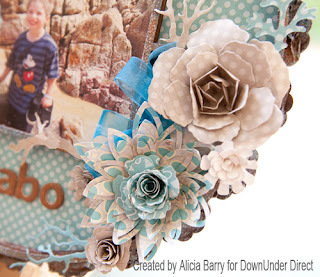 Today we have another fun layout to share. The Crafters Workshop stencil – Houndstooth. Today we have a couple more Christmas cards to share with you. "Although this card is really quite dimensional, it will pack flat for posting. 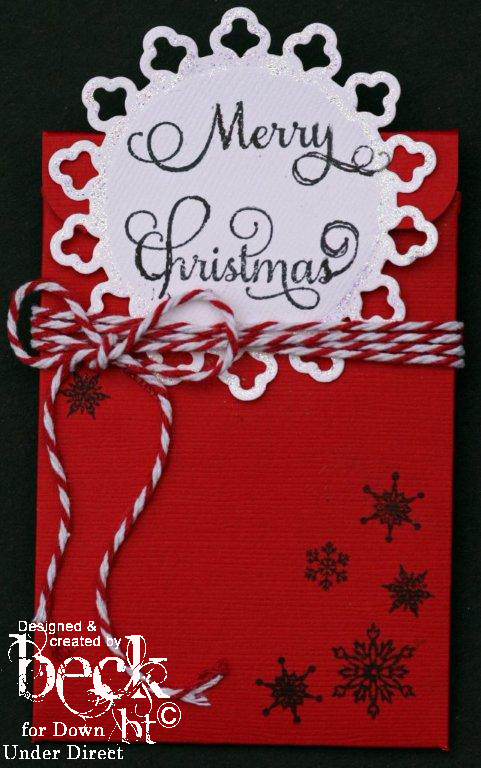 The centre bauble will need some simple tweaking once the card reaches its destination." "This is a Christmas gatefold card. It's one of the simpler interactive cards that are pretty quick to put together if you need to make a batch of them. The centre circle is adhered to one side of the gate, and the scalloped ring to the other. That's about as hard as it gets!" Here we have another masculine themed layout. "There are a huge number of Spellbinder dies to make lots of different flowers and blossoms. Some are fairly straight forward, but some look a little strange...until you know what you are doing of course. Bauble blossoms are one of my favourite kinds of paper blossoms. 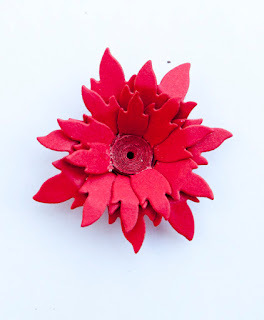 The die will give you a flat strip of petals, but a quick and easy flick of the wrist will leave you with a beautiful little 3 dimensional flower. 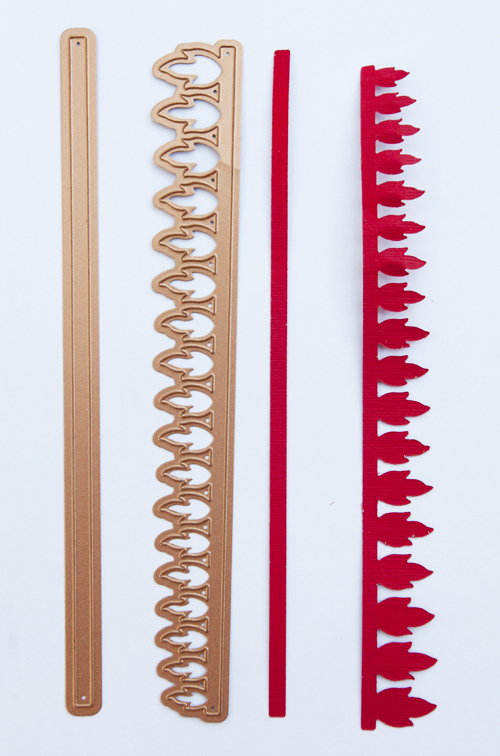 Allow me to get you addicted..."
Use a quilling tool to roll the centre strip into a tight ball. Glue the end down and set aside. 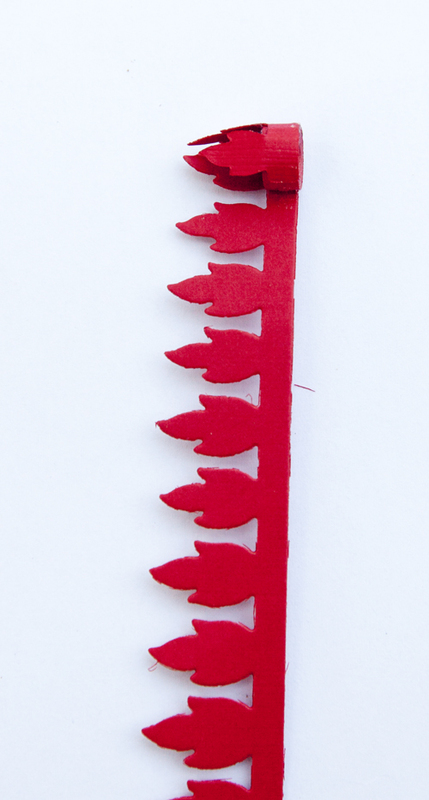 It will be easier to curl the petal strip if you give each petal a slight crease through the centre. Adhere the smaller end of the petal strip to the tight roll. 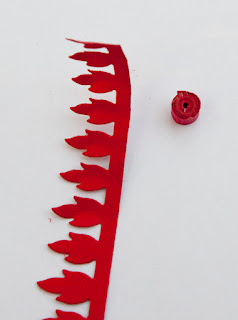 Continue to curl the entire strip adjusting the tightness to ensure that the petals are overlapping each other to fill in the gaps therefore creating a full blossom. 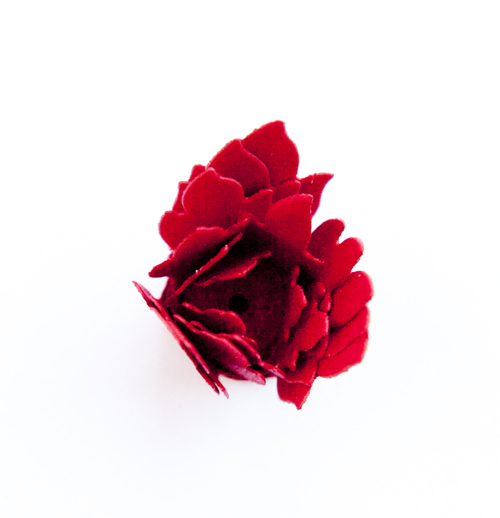 Fold down each petal, then gently shape each petal to form a dimensional flower. 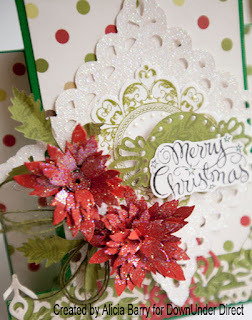 You can then embellish with glitter or ink if desired. 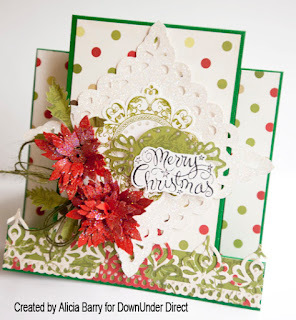 Today we have another card using the new pre cut step card blanks. 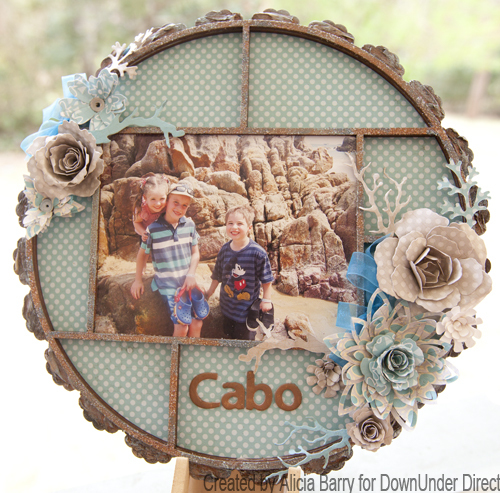 Today we have a great idea to make a feature of those treasured holiday photos. 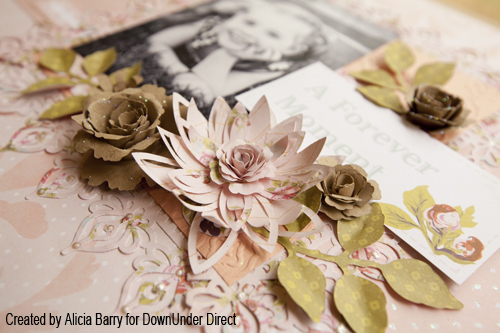 "The gorgeous Blossom Five die compliments one of my favourite photos beautifully." 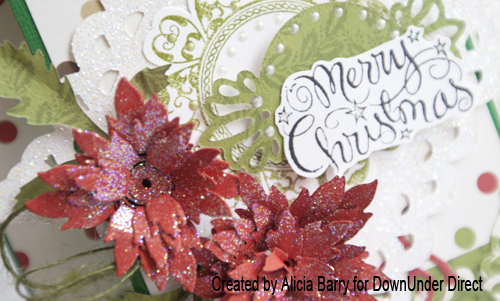 The new pre-cut and pre-scored step card blanks make creating these fun cards super easy. 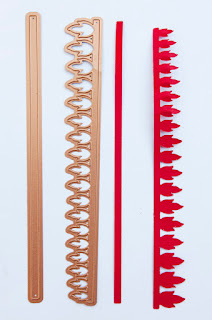 There are three different designs and an assortment of colours available. 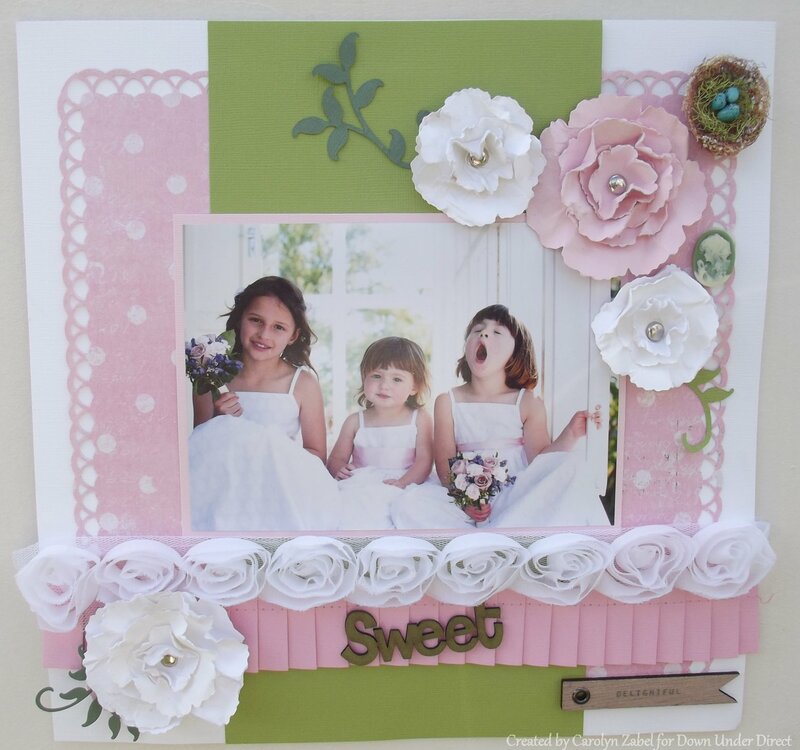 Today we feature another lovely layout from Sheree. This is our second post today, please scroll down for an earlier one from Carolyn.